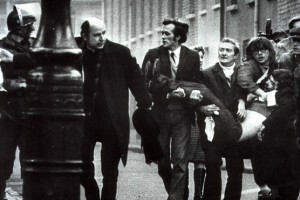 Bloody Sunday took place in 1972 in Northern Ireland. Marchers in Derry were shot at by members of the British armed forces resulting in the death of 14 people. This presentation looks at the events of that day, providing a chronology of events and an overview of the evidence that was presented to the enquiries into the shootings. This presentation is aimed at 1-9 GCSE History standard pupils. It has also been used with KS3 learners. The presentation does not include activities. Bloody Sunday happened at a time when Civil Rights was an issue in Northern Ireland. Campaigners used marches such as the one held in Derry to promote the case for improved civil liberties. Areas were being subjected to house to house searches, stop and search was common and internment was being used. The use of these methods was seen to be highly discriminatory. It changed opinion in Nationalist areas and led to heightened suspicion of the authorities. In the months leading up to Bloody Sunday there had been a number of significant events in Northern Ireland. Terrorist activity had increased. The British armed forces had also shot people. The situation was tense, Bloody Sunday made it much worse.